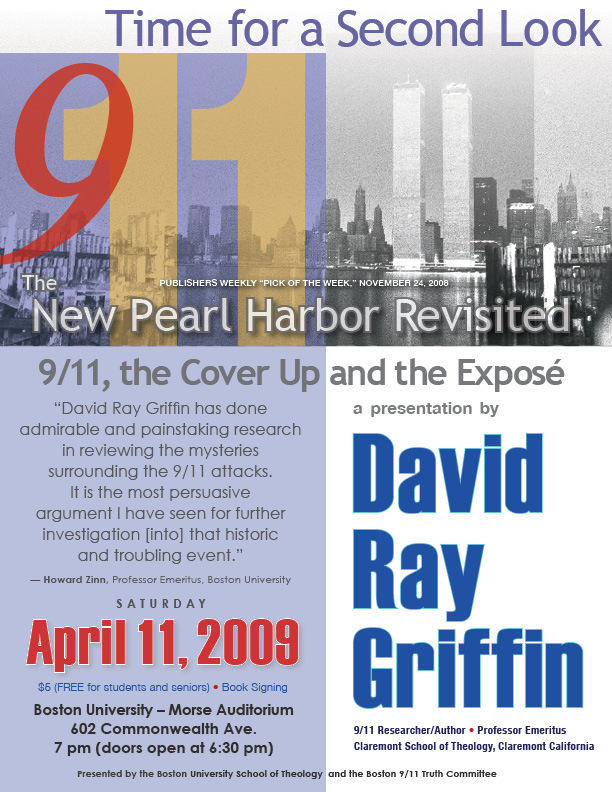 The Boston 9/11 Truth Committee is pleased to announce that we are co-sponsoring a public lecture and book signing by renowned 9/11 author and researcher David Ray Griffin, in conjunction with the Boston University School of Theology. The event will take place at Boston University’s Morse Auditorium, 602 Commonwealth Ave., Saturday April 11, 2009 at 7pm. Donation: $5, students and seniors admitted free. This is a watershed event for truth activists in Boston, marking the first official recognition of a 9/11 truth speaker and/or co-sponsorship by a college or university in the Boston area. Boston is home to over 100 colleges and universities with an annual student population of 250,000 in the Boston/Cambridge area, alone. BU has 30,000 students. We are asking Truth activists around the country to encouraged any students you know who are attending school in or near Boston to come and listen to Dr. Griffin’s new presentation, “9/11: Time for a Second Look,” which he is previewing in the Northeast just prior to embarking on a European tour. In addition to his Boston appearance, Dr. Griffin will also be speaking at Vassar College on April 8, in Portsmouth, New Hampshire on April 9, and in Keene, New Hampshire on April 10. The Boston presentation will be his last before leaving for Europe. We are encouraging New Englanders north and west of Boston to support the two southern New Hampshire events, and those near and south of Boston to join us at BU on the 11th. We are hoping to attract lots of BU students, but there is plenty of room for everyone, so please come and help us show the Boston University population just how may people don’t by the official tale of 9/11. This is dynamic! Griffin is such a wonderful speaker! TomT on Thu, 03/12/2009 - 6:55am. ..........Thank you ! You're an inspiration for the truth, at a time when America needs it desperately. WISDOM on Thu, 03/12/2009 - 7:59am. Hummux of www.911tv.org requested any recordings of this tour by David Ray Griffin to produce into a finished dvd. Also, please, if possible, make sure we get a youtube statement from Dr. Griffin, similar to his "Statement of Support for the NYC 9/11 Ballot Initiative, posted on blogger at http://www.911blogger.com/node/15910 We need such statements to unite the Truth Movement. 30,000 petitioners have signed the petition. William Pepper confirmed that signatures from last year can be used for a referendum vote this November 3, 2009 in NYC, which is why the Conference in NYC on 9/11 could be so critical to bypass the politicians and media.. for our supporting a peoples' vote for a real investigation. today i am headed to keene NH to distribute Green Living a wonderful ecojournal that helps support Flyby News, including a free ad. While distributing, I will be posting flyers for the David Griffin presentation on April 10th in Keene. Last night in Northampton, MA, we had a wonderful screening of 9/11: Blueprint for Truth www.ae911truth.org - I found this newest version as super clear - leaving no trace of any reasonable doubt about demolitions vs fire for buildings' collapses. About 40 or more folks attended, and received this presentation as if Richard Gage was there.. the beauty of film cloning keeps rippling around the world. It is wonderful to have Richard Gage in many places at once. This is our year! Please combine campaigns.. reach out to architects, engineers and citizens, especially in NYC, since this November vote could provide us with a real investigation. Thanks to all.. and posting this info that Boston U is finally on the scene, a wonderful sign that the times, they are changing..
jonathan mark on Thu, 03/12/2009 - 8:19am. WoW! jonathan! Great job promoting 9/11 Truth! I love hearing about ACTIONS such as what you are doing. We are going to win this stand for Truth with actions such as these. TomT on Thu, 03/12/2009 - 10:13am. more than anyone else ..
.. DRG has documented the crime of 9/11. His books have recorded the evidence in an incredibly detailed and supported way. New Pearl Harbor Revisited is fantastic - and is a good reminder for when we get down - that Truth is on our side. Thank you David Ray, I look forward to hearing you in person for the first time. TWG on Thu, 03/12/2009 - 8:22am. I will be definitely making the trip to Portsmouth April 9th! jimmyb207 on Thu, 03/12/2009 - 9:29am. Cosponsored with BU? I'm very impressed. WinstonKirk on Thu, 03/12/2009 - 2:32pm. Looking forward to hear Mr. Griffin speak. MG on Thu, 03/12/2009 - 2:56pm. DRG is the best spokesman the 9/11 truth movement has. I am sure he will do just fine. I saw him speak in Oakland to a packed house. He was just magnificent. I hope people listen to what he has to say. He cannot be debunked. 9-11 Joe on Thu, 03/12/2009 - 5:31pm. Way to go, Boston Crew! Good work getting this together! President Ford on Fri, 03/13/2009 - 2:31am. It would be interesting to put Chomsky on the spot if it all possible. That would be great. Cornelius on Sat, 03/14/2009 - 4:49am. andhowe on Sat, 03/14/2009 - 2:14pm. Something appears awry in the comments section on this story where they are showing that they were posted last month. You might want to take a look. Michael on Wed, 04/08/2009 - 7:07pm. Standing room only, has to be the goal. truthoverprofit on Wed, 04/08/2009 - 8:00pm. I noted at the beginning of the blog that this was originally posted in March, so were a bunch of comments. We cool. Reprehensor on Wed, 04/08/2009 - 8:38pm.